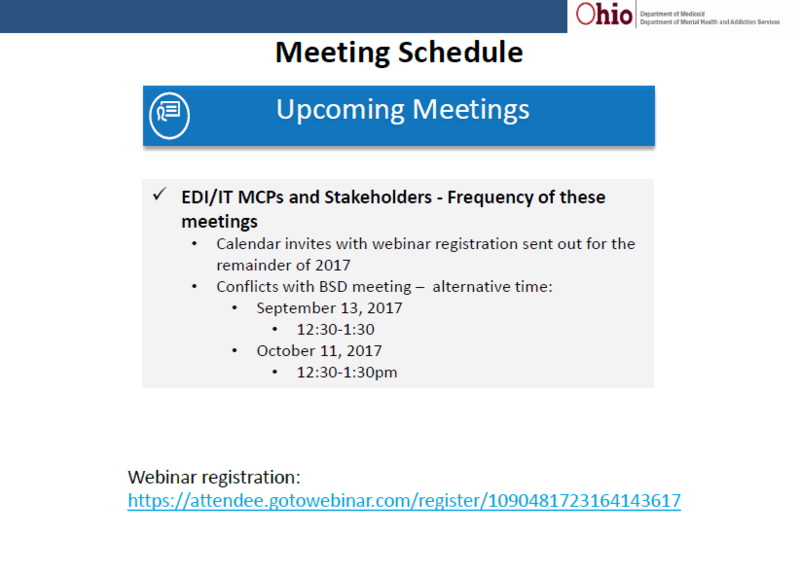 Several updates were announced at yesterday’s EDI Work group at Medicaid. The full slide deck is available here. First, dependently licensed and unlicensed providers will be required to register with Medicaid AND be affiliated to their agency by July 1st, 2018. During the meeting, discussion occurred about the change requiring a new IT build between January 1st and July 1st due to the change in registration requirements. A potential option was raised to make use of modifiers optional beginning July 1st. That idea will be taken back and discussed and we will be updated at a later date. For Qualified Mental Health Specialists (QMHS), Care Management Specialists (CMS) and Peer Recovery Supporters (PRS), a new provider type and specialty will be created and the state will provide additional information as details are available. We did request when the ability to register these new providers will be available and they said the system needs modified and we will be updated once a date is set to allow. For now, best practice would be to go ahead and start getting your providers set up with an NPI through NPPES, as that will be the number that each are billed under and many of these provider levels may not currently be obtaining an NPI. 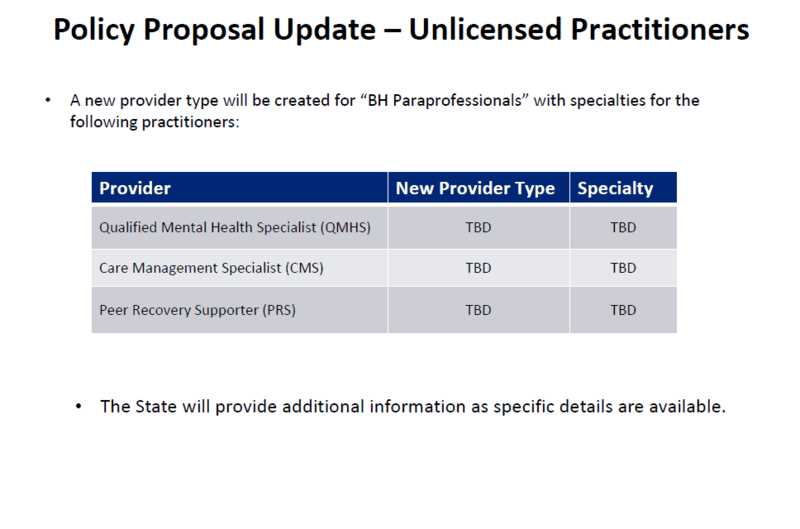 The next important update was for Mental Health Counseling for dependently licensed providers. 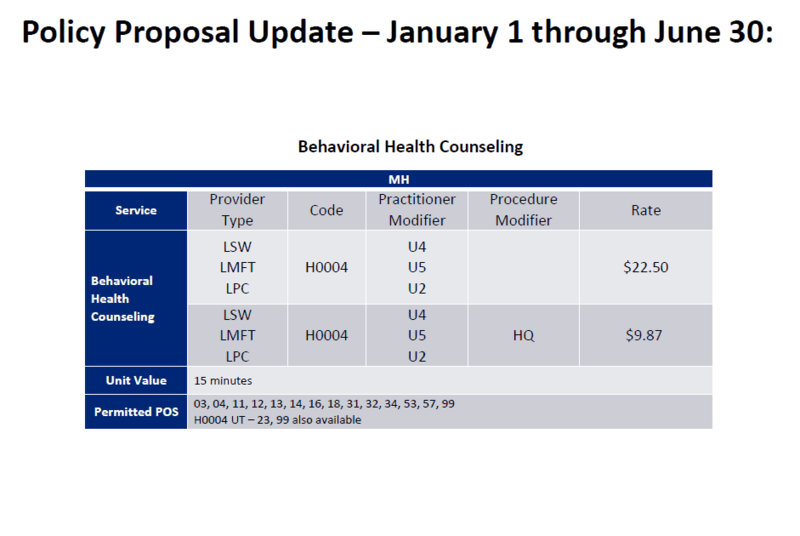 Current rate sheet has options for these providers to provide CPT codes but there is not a valid HCPC option for mental health counseling, both individual and group. So they are adding H0004 with a 15 minute unit of service for type 84 providers. There was significant discussion about other provider types that are not listed on this, the comparison of the rates for these codes to CPT codes and SUD H0004 rates. They will be taking those questions back for another meeting to decide on these pending issues that were brought up. We did ask if there was guidance on when to use a CPT vs. HCPC and the answer was that it left at the agency level, Medicaid does not dictate the service codes you choose in this situation. Most of the documentation released since the decision was made to go live with Redesign and MCO carve in on January 1st, 2018 states we should begin testing with the individual Managed Care organizations, I requested some additional information to be made available. There is another group meeting with Ohio Council, stakeholders and MCO’s to create documentation that should provide an organized document that details the steps needed for each different MCO. They stated it is hoped to be completed by the end of the month and would be released at that time. In addition, there are regional meetings to be held in September and October where agencies can meet directly with MCO representatives and we requested that information be released as soon as possible so agencies can schedule accordingly. During the meeting, the still outstanding Behavioral Health Agencies with no affiliated providers was discussed. 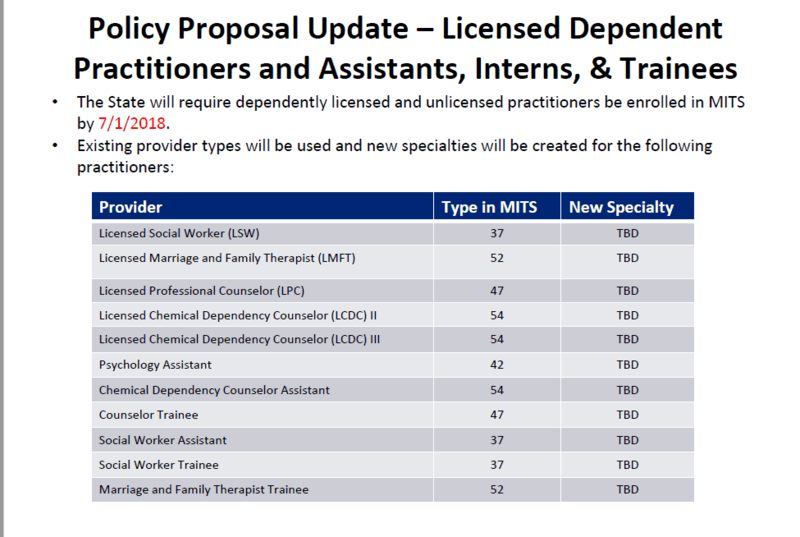 We have approximately 64 agencies without any affiliated providers (just the independently licensed level) and since an affiliated provider is needed to request a prior authorization, this is concerning. We discussed looking at different options to reach out to everyone in a more efficient manner, especially with the addition of all dependent and unlicensed providers. Since independently licensed providers usually average 25% or less of an agency’s workforce, it will be critical to ensure that everyone understands and follows the correct process for registering providers. Below is the new schedule for future EDI work groups. A couple had to be moved to allow for the Benefits and Services work group, however the August 9th B&S work group has been cancelled. 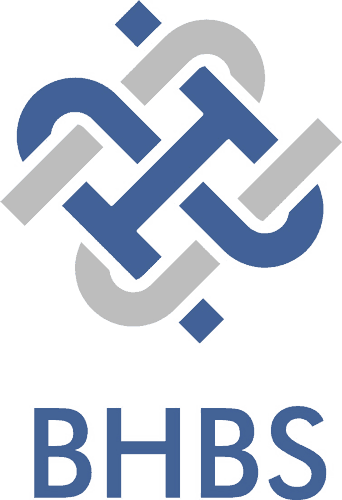 To register for future EDI work group meetings, please see this link.